Authorities in Beijing have raided and shut down a large Christian church amid nationwide raids targeting Protestant groups, particularly those not registered as "patriotic" with the ruling Chinese Communist Party. The bureau of civil affairs in Beijing's Chaoyang district issued a notice banning the Zion Church on Sunday, saying it had broken rules by organizing mass gatherings without registering with the authorities. Photos sent by church members to RFA showed police officers sitting outside the church's now-shuttered entrance following a raid during which police confiscated the church's "illegal promotional literature." Xu Yonghai, an elder of the Beijing house church Christian Saints Love Fellowship, said the church has now been "sealed off" by police, and its members forbidden to gather there. "Our brothers and sisters can't get inside any more," Xu said. "The police and religious affairs bureau officials sought [church leaders] out for a chat." "I don't know where they are going to meet for worship after this," he said. Social media posts by Zion Church members said police descended on the church as soon as the Sunday service was over, in a huge operation that saw fire and rescue vehicles, ambulances and large buses parked outside the building where the church was located. A church elder surnamed Yi said more than 100 police officers and government officials had burst into the church premises on Sunday, detaining some church members who tried to stop them shutting the place down. "There were a lot of police vehicles, and even fire and rescue vehicles and ambulances," Yi said. "Their pretext was that we hadn't registered [with the government-backed Three-Self Patriotic Association of Chinese Protestants]." "About 200 people came [to resist], but they couldn't get back inside the church by that time," he said. "About 15 people were taken aboard the bus." "We can't get in; they have even changed the locks, and left people to stand guard," Yi said. " An officer who answered the phone at the Chaoyang district police department declined to comment when contacted by RFA on Monday. "I don't really know about this," the officer said. "You should contact the propaganda department." But repeated calls to the Chaoyang district propaganda department and the department of civil affairs rang unanswered during office hours on Monday. The raid on Zion Church comes after similar raids on Protestant churches in the central province of Henan in recent weeks, and is part of an ever-widening nationwide operation targeting unofficial "house churches" across China, according to Ma Ke, a pastor in the southern province of Guangdong. "There has been no let-up," Ma said. "They have come after us, too, taking photos and calling us up." 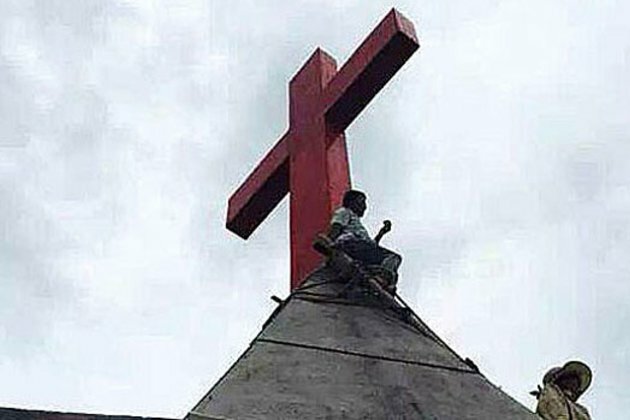 A Protestant church member who asked to remain anonymous said police had also raided Protestant churches in the southwestern city of Chengdu and the central city of Zhengzhou on Sunday, for breaching a recently amended law on religious groups. "They were all house churches, and they have all been prevented from holding any more gatherings," the church member said. "I can't understand why they want to target Protestants. The law is supposed to limit evil-doers, but now it's targeting the good people. I just don't get it." "Perhaps the values of Protestant Christianity are entirely at odds with those of this regime: one is on the side of the light, while the other is on the side of darkness," he said. In April, the administration of President Xi Jinping asserted its control over all religious practices among its citizens. "Religions in China must be Chinese in orientation and provide active guidance to religions so that they can adapt themselves to the socialist society," according to a white paper on religious affairs published at the time. Religious believers must "be subordinate to and serve the overall interests of the nation and the Chinese people ... and support the leadership of the Chinese Communist Party," the white paper said, which includes "integrat[ing] religious teachings and rules with Chinese culture." Last month, authorities in Henan flew the red flag of the People's Republic of China over the Shaolin Temple for the first time in the temple's 1,500-year history. Overseen by officials of the Chinese Communist Party's United Front Work Department, which is campaigning for religious groups to show their "patriotism," monks at the temple raised the red flag with its five gold stars at a "grand" ceremony. Reported by Wong Lok-to for RFA's Cantonese Service, and by Yang Fan for the Mandarin Service. Translated and edited by Luisetta Mudie.